So you have an amazing product and it’s time to create a killer landing page to sell it. Here’s how we did it. Most landing pages for SaaS products tend to focus too much on highlighting what you get (the features) and not enough on what it will do for you (the benefits). Those that do highlight the benefits tend to go too far. There’s too much “marketing fluff” and you’re left walking away thinking “what the #$%^ does this product actually do?”. An effective landing page needs to highlight both your product’s benefits and its key features. It needs to do so concisely, using language that resonates with your target audience. So, where do you start? We believe that some products are better defined by the job they do than the customers they serve. Customers come in all shapes and size, from all verticals and industries. The only thing in common is the job they need to get done. The first thing you should do before writing a single line of landing copy is get an intimate understanding of the job people are hiring your product for. Know what creates demand for it and what people are searching for when looking for a product to hire for that job. Clay Christensen refers to this as job-based marketing. 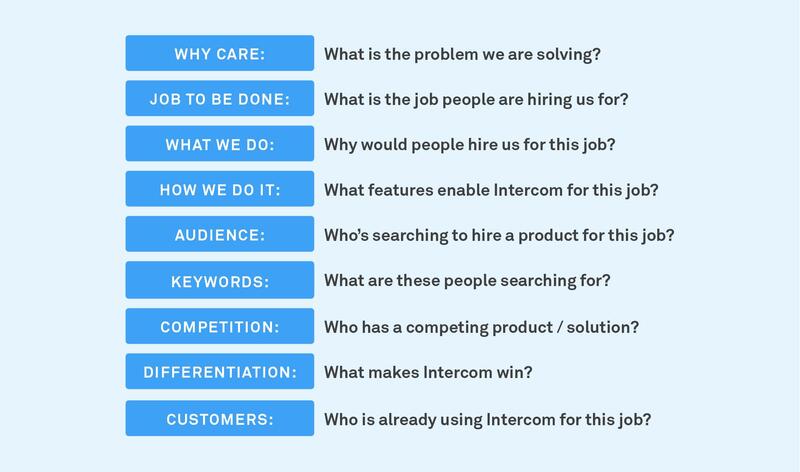 How did we identify the jobs people hire Intercom for? With the Jobs-To-Be-Done approach in mind, we engaged the good guys over at The Rewired Group to understand what these jobs were for Intercom. The process involved interviewing a mix of active, inactive, lost and trial customers. We then meticulously studied and debated the conversations we had with each of them to truly boil down what is was that they each “hired” Intercom to do. Check out this talk I gave on the topic for deeper look into the approach we took. Next up we created a messaging guide – a document that serves as the basis for piecing together the content on the landing page for each job. Your landing page is going to be useless if your target audience can’t find it. When people are looking for products to hire for a job they need done, unless they have a clear product in mind they’ll search for one using a few keywords. Identifying and focusing on those keywords in your page URL, headline and landing page copy is one simple tactic to improving your page’s organic rank (and driving more site traffic) in search engines such as Google. There’s much more to it than that and there are loads of best practices for SEO. We recommend this one from experts in inbound marketing Moz, The Beginner’s Guide to SEO. 8 seconds. According to some, that’s all the time you have to capture a visitor’s attention. So it’s critical that the first thing a visitor sees on your landing page makes it clear that your product can do the job they need done. We call this the hero. Here’s what we came up with for our landing page for the customer support job. With only a handful of seconds to make an impact, your copy and headline must be punchy and the illustration needs to be simple to understand. “Show, don’t tell” is particularly crucial when marketing novel software. It’s a much more efficient way to communicate what a new product does than relying purely on text or a bulleted list of features. People are far more likely to click a play button than they are to read a paragraph of text. That’s because humans are inherently lazy and would much rather be spoonfed an idea than have to read it themselves. So we always include a video in each landing page that shows and tells you how Intercom can help you get that specific job done. We aim to keep our videos under two minutes (or as close to two minutes as we can get). Why? According to video experts Wistia, shorter videos are better for getting people to watch the whole thing. We trust them. Creating product videos is often considered too hard or time consuming. It’s not. Our resident video expert Phil put together this great guide to help you get started. It’s no secret that our landing pages are long. You’ve probably heard the myth that “long pages don’t sell” and it’s much better to have short pages that don’t require scrolling. If your content is not engaging, that’s probably true. But, if your content is engaging, then why wouldn’t people scroll? Check out Unbounce’s post, Size Matters: The Long and Short of Conversion Marketing, if you need more convincing. On each of our landing pages once you scroll past the hero section we introduce a “sticky-nav”– a navigation bar that sticks to the top of the browser window as you scroll down the page. This landing page design feature provides quick access to jump to key sections of the page – overview, features, and pricing – and an ever present call-to-action to sign up. Now that you’ve piqued your audiences’ interest you need to backup your claims. For us, this meant breaking down the job into easily digestible chunks. These “sub-jobs” make up the “Overview” section of each landing page. We took different approaches to this section for each of the jobs. For example, on our customer engagement page we show the different types of in-app and email messages you could send throughout the different phases of the customer lifecycle. We make use of looping videos to show what those messages could look like inside your web or mobile app. In order to do the things you’ve just claimed, your product needs certain features. People don’t need every feature your product offers, they just need to know about the ones that matter most for the job they’re looking to hire your product for. The “key features” are the must-haves. The features that are essential for your product to get the job done and in some cases differentiate you from your competitors. We clearly state what these are and make them discoverable towards the very top of the page. Then there are the “table stakes”, features that aren’t core to getting the job done, but become important when stacking your product up against competitors. We designed this section as a grid to make it both easy to scan and look like a checklist. It’s incredibly important, especially if your product is new, to establish credibility with prospects. Surfacing some of your most recognizable and successful customers is a quick way to do this. Logos are social proof points which show site visitors that there are real businesses using your product, but ultimately, people are looking to understand if there’s ROI. That’s why we highlight key results that customers have seen using Intercom for a particular job. A key question people want answered is, “can I afford this?” You should make it easy for them to find an answer. On each of our landing pages, with the exception of our free platform of course, we have an ever present link to enter our product store and view pricing. This one’s simple. If you don’t make it dead clear how they can try your product, they won’t. That’s why we include multiple call-to-actions throughout the page. There’s one right beneath the hero section for people who are convinced straight away, have been referred by someone who’s done the selling for you, or repeat visitors ready to pull the trigger. There’s another one near the bottom of the page and an ever present one in the “sticky nav” that follows you as you scroll down the page. Placement is just one thing to think about. The other is copy. LeadPages have a classic post on landing page trends that covers this topic in detail – check out Trend #8.
always room to improve your conversion rate. This one’s a no-brainer. Implement it before you put your page live, so you can track visits, page views, goal conversion and more. Did I mention it’s free? Using Inspectlet’s heatmaps feature, we can see what people are clicking on or likely to be reading. We also use the scroll heatmaps feature to see how deeply visitors scroll down our long pages. 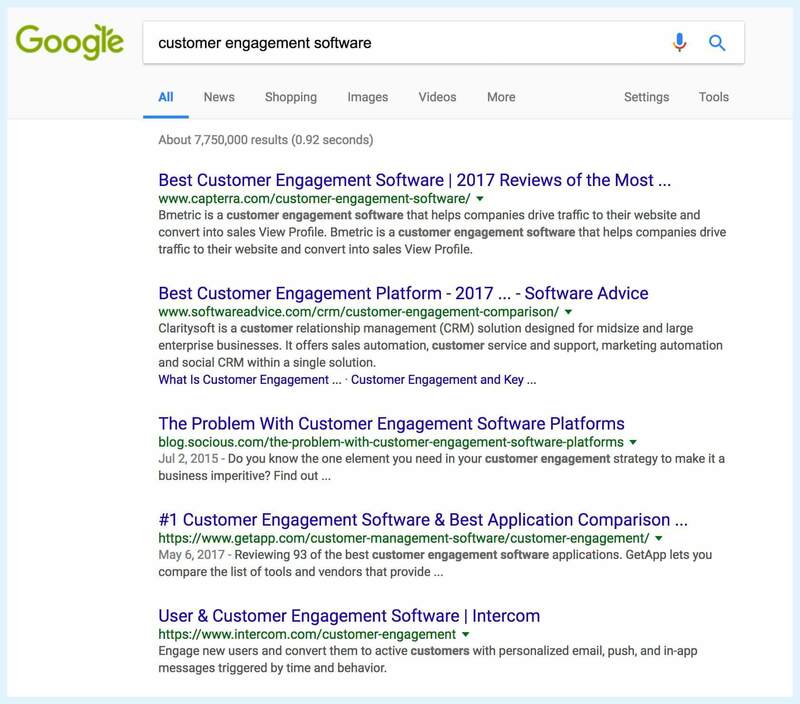 In instances where we notice that customers aren’t scrolling on new landing pages we’ve launched, our Marketing and Research teams have gotten together to iterate the page design, which we continue to monitor using Inspectlet’s scroll tracking. Usertesting.com allows you to capture videos of real people talking out loud as they use your product, whether it’s a website, a mobile app or even a prototype. You can ask these people questions or set them tasks to complete. One of the huge strengths of usertesting.com’s product is its video editing capabilities which are optimised specifically for research purposes: you can quickly annotate the videos of your users and make a highlight reel of e.g. five users explaining your pricing page. These videos will help you pinpoint any areas of user confusion with your site, or usability issues. You can then share the video clips with stakeholders in your company via a simple link and convince them of what needs to be changed. In addition to the learnings you’ll discover through using the tools above, you’ll likely have some hypotheses of your own that you should test. Enter Optimizely. 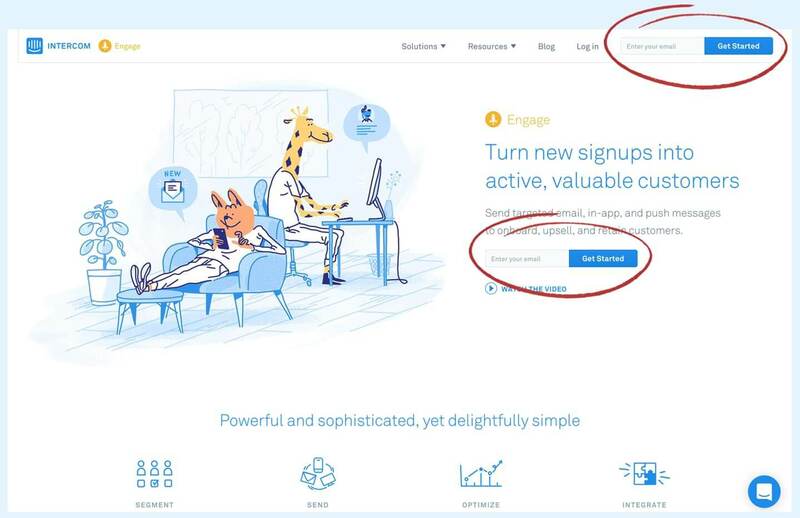 Whether it’s a simple change such as a different color or copy on a call-to-action button or something more drastic, Optimizely makes it incredibly easy. 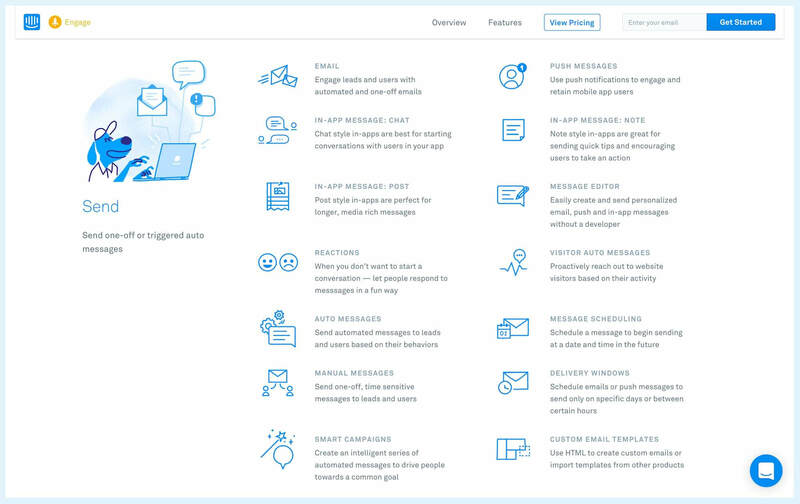 One test we recently performed was removing an entire section from one of our landing pages – the grid of feature icons from our customer engagement landing page. Our hypothesis was that considering the long length of the page, we could forgo some of the content and convert at a higher rate. We were wrong, the original won. Lesson learned. Building a landing page is not easy, but if approached methodically it can be done efficiently and still produce results. It’s early days, but we’re seeing conversion rates (visit > email opt-in signup) of ~3% across each page. Considering the nature of our product we think this is a good baseline to improve upon. We’re still learning – whether it be direct feedback via usertesting.com, conclusive experiments with Optimizely, or just how to explain each job better. Chances are that our landing pages will look different the next time you look at them. That’s enough from us. What’s worked for you?